Codling Moth (CM) -- Codling moth development as of June 29: 1st generation adult emergence at 99% and 1st generation egg hatch at 87%. If targetted codling moth control is needed, key management dates are: 1st generation 3% CM egg hatch: June 3, Friday = target date for first spray where multiple sprays needed to control 1st generation CM. 1st generation 20% CM egg hatch: June 10, Friday = target date where one spray needed to control 1st generation CM. Obliquebanded Leafroller (OBLR) -- Where waiting to sample late instar OBLR larvae is not an option (i.e., where OBLR is known to be a problem, and will be managed with an insecticide against young larvae): Early egg hatch and optimum date for initial application of B.t, Delegate, Proclaim, Intrepic, Rimon, Altacor, Belt, pyrethroid or other insecticide effective against OBLR (with follow-up applications as needed): June 21, Tuesday. Where waiting to sample late instar OBLR larvae to determine need for treatment is an option, or to check on results from earlier sprays: Optimum sample date for late instar summer generation OBLR larvae: June 30, Thursday If first OBLR late instar larvae sample is below threshold, date for confirmation follow-up: July 3, Sunday. Oriental Fruit Moth OFM -- 2nd generation OFM flight begins around: June 25, Saturday. 2nd generation - first treatment date, if needed, July 2, Saturday. 2nd generation - second treatment date, if needed: July 14, Thursday. Redbanded leafroller (RBLR) -- 2nd RBLR flight begins around June 26, Sunday. Peak catch and approximate start of egg hatch: July 9. Spotted Tentiform Leafminer STLM -- 2nd STLM flight begins around: June 14, Tuesday. Rough guess of when 2nd generation sap-feeding mines begin showing: July 2, Saturday. Optimum first sample date for 2nd generation STLM feeding mines is July 9, Saturday. 13-July, 2016 (Wednesday). Massachusetts Fruit Growers' Association Summer Meeting, UMass Cold Spring Orchard, 391 Sabin Street, Belchertown, MA. 10 AM to 2:30 PM For more information and to pre-register (by July 11 please! ): http://massfruitgrowers.org/2016/2016summermeeting.html. Most of what I have to say is covered below. It's that time of the year when things begin to look, well kind of ugly at times. The apple crop is looking better though. (No change in the stone fruit situation.) 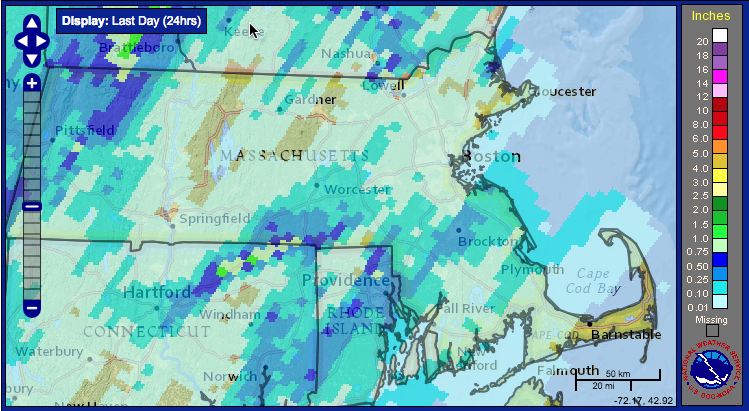 Most of us seriously need some more rain, less than 1/4 inch received here at the UMass Orchard in Belchertown in the past day. (See map below.) 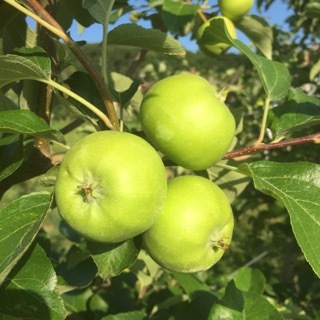 Speaking of the UMass Orchard, please come to the MFGA Summer Meeting on July 13, you can pre-pay and register on-line here. Once again, Outlook Farm will be catering, so we should have a good lunch, and our special guest will be Win Cowgill who just retired from Rutgers but now does orchard consulting -- you can ask him your hard questions during the meeting and orchard tour for FREE! • I have not seen any yet in Belchertown, but I'd be on the lookout for potato leafhopper (PLH) any day now. Threshold for tolerance is zero in new plantings, consult NETFMG for treatment options, many insecticides are effective, however, Assail, and imidacloprid would be good "softer" (i.e., beneficial insect-friendly) options. • Obliquebanded leafroller (OBLR) treatment (Altacor, Delegate, Belt, among others, see NETFMG) should probably have gone on by now, however, it's still not too late if you haven't already done it. • Green apple aphidsare abundant this year! Generally, treatment is not necessary as predators are out there, they will just take some time to clean things up a bit. • Apple maggot fly (AMF) could begin emerging any time, although dry soil conditions generally hinder them getting out there. Please see Guest Article for everything you need to know about hanging traps and monitoring. Where and when necessary, consult the NETFMG for recommendations. • European Red Mites (ERM) have been more of a show this year than in recent years. (They like dry weather.) Pretty easy to clean-up with any number of miticides, consult the NETFMG for specific recommendations and rates. • Fire blight is out there, but not excessively, and we are seeing -- and cutting out, mostly to no avail -- ongoing shoot blight on Ginger Gold at the UMass Orchard. I suspect just after Memorial Day during the first week in June when fire blight conditions were "extreme" is when most of these errant infections originated. We have sent diseased samples from several orchards to Quan Zeng at the CT Agriculture Experiment Station to test for streptomycig resistance. So far they have tested negative for resistance (but indeed positive for fire blight). Where you are seeing strikes, particularly in young trees, a prophylactic program of low rate copper (Cueva or similar) with a biological control agent (Double Nickel among others?) is not a bad idea. Remember to be careful with copper on bearing trees, as it can affect fruit finish. 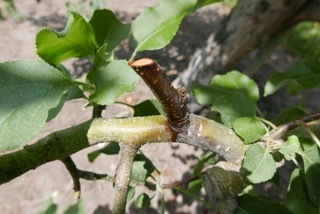 Cut out any strikes you see, and if you get wind-driven rain or hail in an apple block afflicted with any fire blight, you need to get out there and put streptomycin on within 24 hours of the "trauma" event. 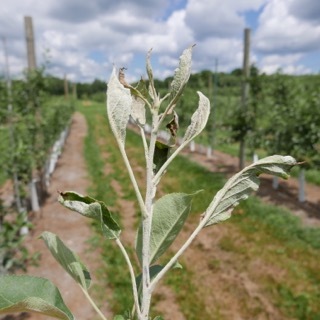 • You may be seeing some powdery mildew out there on susceptible apple varieties (such as Honeycrisp), dry weather has been favorable. Not much to do now, but remember, it will start to build-up in the orchard, so next spring (before bloom) need to be applying some fungicides with PM efficacy in addition to apple scab. 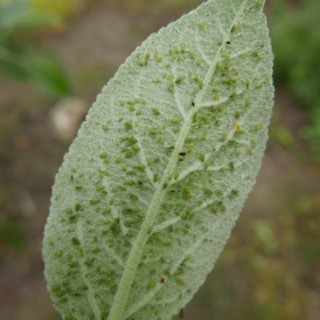 • I hate to bring you the bad news, but it's probably time to start the 2-week fungicide program for sooty blotch and flyspeck (SBFS) and other summer fruit rots. If you have not already done so. Full rate Captan or Ziram sprays are the basic plan; Topsin-M or Flint or Sovran or Captan + Topsin-M (or a phosphite) are an upgrade (longer time between sprays), and Pristine or Inspire Super are the premium plan (although I would save those for later in the summer). • Irrigation. It's still dry. 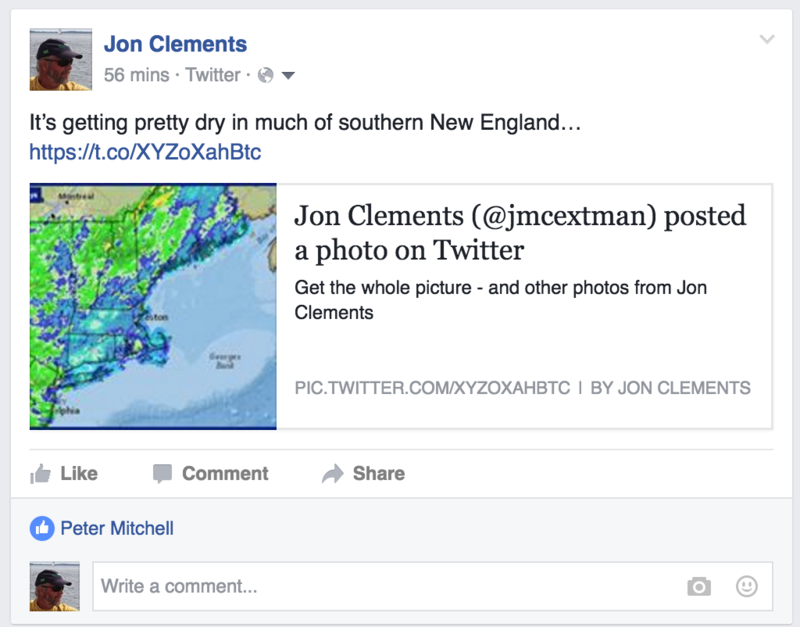 Particularly in and around Belchertown. See map above. Turn on the water if you have it. • Hand thinning. Plenty of fruit clusters out there unfortunately. 3-4-5 fruits is not cool, but 2 are okey dokey, unless there is a good crop on the trees, then onesies are the target. 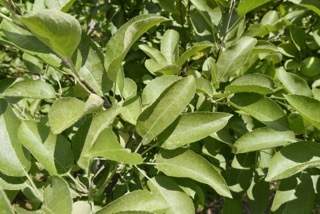 • Calcium sprays should be ongoing, consult the Foliar Calcium Sprays for Apples for all you need to know. • Return bloom sprays using NAA (Fruitone or Pomaxa) are probably not as necessary this year as most, however, they can't hurt. Just put 2-3 ounces (depending on tree size) of Fruitone-L or Pomaxa per acre in the tank with the next three or so cover sprays. Like I said, it can't hurt. For more details or another option (Ethrel, but I prefer NAA for this purpose) see Enhancing Return Bloom of Apple. 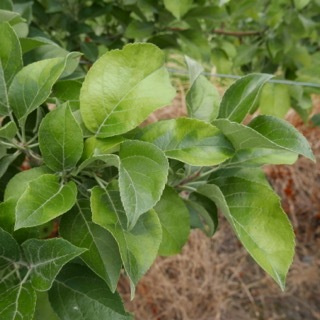 • The Honeycrisp yellows or chlorosis is showing up on lighly cropped Honeycrisp. Not to be confused with a nutrient deficiency (maybe?) or other disorder. Reprinted from Scaffolds Fruit Journal, Vol. 25, No.15. June 27, 2016. 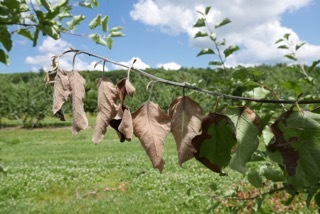 We are again at the time of year to expect the first appearance of apple maggot (AM) flies in wild apple trees and abandoned orchards, which begins first in eastern N.Y.; western N.Y. could be about a week later, depending on what kind of temperatures and rainfall we get over the next week or two. Crop scouts and consultants have used traps to monitor AM populations for many years, but this approach, useful as it is, nevertheless is not recommended in all cases. Some orchards have such high or such low AM populations that monitoring for them is not always time-efficient. That is, in some blocks, sprays are necessary every season, often on a calendar basis; however, in some blocks the populations are so low that they are rarely needed at all. 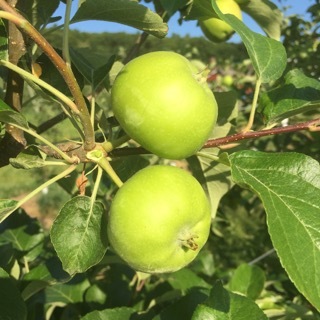 However, most commercial N.Y. orchards have moderate or variable pressure from this pest, so monitoring to determine when damaging numbers of them are present allows growers to apply only the number of sprays necessary to protect the fruit from infestation. Sticky yellow panels were some of the first trpas for AM, and have been in use for over 50 years; these can be very helpful in determining when AM flies are present. The insects emerge from their hibernation sites in the soil from mid-June to early July in New York, and spend the first 7–10 days of their adult life feeding on substances such as aphid honeydew until they are sexually mature. Because honeydew is most likely to be found on foliage, and because the flies see the yellow panel as a "super leaf", they are naturally attracted to it during this early adult stage. A few of these panels hung in such an orchard can serve as an early warning device for growers if there is a likely AM emergence site nearby. Many flies pass this period outside of the orchard, however, and then begin searching for fruit only when they are ready to mate and lay eggs. That means that growers don't always have the advantage of this advance warning, in which case the catch of a single (sexually mature) fly indicates that a spray is necessary immediately to adequately protect the fruit. This can translate into an undesirable risk if the traps are not being checked daily and are used to signal an immediate response, something that's not always possible during a busy summer. To regain this time advantage, more effective traps have been developed, which are in the form of a "super apple" — large, round, deep red, and often accompanied by the scent of a ripe apple — in an attempt to catch that first AM fly in the orchard. Because this kind of trap is so much more efficient at detecting AM flies when they are still at relatively low levels in the orchard, the traps can usually be checked twice a week to allow a 1–2-day response period (before spraying) after a catch is recorded, without incurring any risk to the fruit. Research done in Geneva over a number of years indicates that some of these traps work so well that it is possible to use a higher threshold than the old "1 fly and spray" guidelines recommended for the panel traps. Specifically, it has been found that sphere-type traps baited with a lure that emits apple volatiles attract AM flies so efficiently that an insecticide cover spray is not required until a threshold of 5 flies per trap is reached. The recommended practice is to hang three volatile-baited sphere traps in a 10- to 15-acre orchard, on the outside row facing the most probable direction of AM migration (towards woods or abandoned apple trees, or else on the south-facing side). Then, the traps are periodically checked to get a total number of flies caught; dividing this by 3 gives the average catch per trap, and a spray is advised when the result is 5 or more. Be sure you know how to distinguish AM flies from others that will be collected by the inviting-looking sphere. 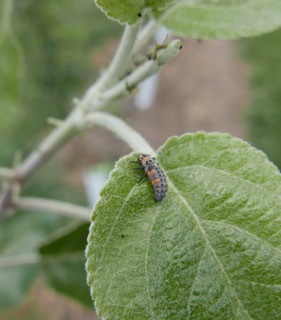 There are good photos for identifying the adults on the Apple Maggot IPM Fact Sheet; check the web version at: http://hdl.handle.net/1813/43071. In home apple plantings, it is theoretically possible to use these traps to "trap out" local populations of AM flies by attracting any adult female in the tree's vicinity to the sticky surface of the red sphere before it can lay eggs in the fruit. Research done in Massachusetts suggests that this strategy can protect the fruit moderately well if one trap is used for every 100–150 apples normally produced by the tree (i.e., a maximum of three to four traps per tree in most cases), a density that makes this strategy fairly impractical on the commercial level. By preparing now for the apple maggot season, you can simplify the decisions required to get your apples through the summer in good shape for harvest. No YouTube video this week. The next Healthy Fruit will be published on Tuesday, July 5 (or thereabouts), 2016. As always feel free to get in touch with any member of the UMass Fruit Team (http://extension.umass.edu/fruitadvisor/team-members) if you have questions or comments.